Hello ... Hello ... my old friends ... It's great to see you once again! This is the third time in which I have attempted to write up my exploits with ELO Beatles Forever [ELOBF] in 2011. I simply didn't realise the amount of output this year. This is the 114th ELOBF blog of the year and first of all I would like to thank each and every visitor for taking the time to check out my writings and musings. 2011 was a year of many varied activities. Interviews, Reviews, Introductions, Recommendations and [of course!] Gigs et al. Hence - I've decided that the best way to cover the year is to simply list some of the highlights. Many thanx go to my concert cohort: Chris 'Joyride' Evans. I've so enjoyed meeting up with such great folks as: Andy Wood; Paul Richardson; Geoff Cook; Martin Kinch; Jeff Cooper; Tilly Bates; Jackee Whale; Ken Latta; Jim Hoban; Phil Hatton; Steve Turner; Phil Ridden; Graham Struggles and Bernie Toner amongst not a few others! So as you can see; it has been a great year and 2012 looks like being busy too. More interviews; more Reviews; more Introductions and even more gigs! Once again I truly thank you for your support and wish you a Happy; Peaceful; Prosperous and ELO-tastic New Year! Michael Laine Hildebrandt and everyone at Bubble Gum Orchestra headquarters(USA)would like to thank Keith and ELO Beatles Forever for all their support in 2011. BGO has aquired many new friends and fans thanks to Keith's ongoing generosity. May you and all your readers prosper in 2012! Thank you so much Keith for your support for my music in 2011. Wishing you all the best for the coming year. 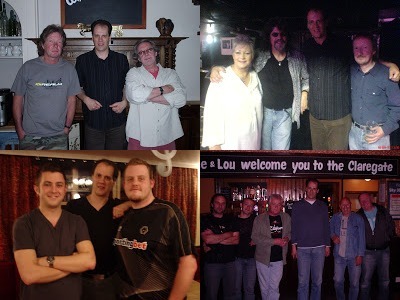 Sean Page and the artists' involved with the USA Bands; Fragile X, Imaginos, Cat Bleu & Navigator thank you beyound words for your dedicated & wonderful support throughout 2011, and we at Fragile X Enterprises look forward to working with you in 2012 and beyond. You are a true friend Keith, and we sincerely appreciate your efforts in helping promote our music! Always, Mack F. Page, Manager.